Do you really want to fight a crazy system? Say, a system that is hugely corrupt & unforgiving to non-conformists? Or a system steeped in bureaucracy and unsupportive of new ideas? A system that can easily tame the likes of Anna Hazare and Dr. Kiran Bedi? Think again. As the Intelligence Bureau agent Khan tells Vidya Bagchi (Vidya Balan) in Kahaani, “This can be very dangerous”. Do you still insist? Then you may have to prepare an arduous journey like going through 36 chambers of Shaolin. Question is: what do you learn in the first chamber? Well, here is a good candidate: How to be invisible. Every crazy system has ingenious ways of making you part of its extended family. So, one of the best ways to avoid getting crushed is by becoming invisible. Let’s see how using the Hollywood movie “One flew over the cuckoo’s nest”. 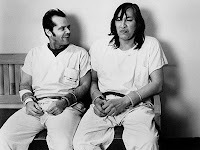 Randle McMurphy (Jack Nicholson) finds himself in a mental hospital and realizes that the whole system is torturing its patients through therapy sessions and subtle humiliation. McMurphy rebels against the system loudly and gets himself trapped in the process. What do you expect happens to McMurphy? Hospital management ensures that his brain gets appropriate treatment and becomes numb. Nothing new in this. This is what is expected from a crazy system. So what does one do? Well, there is another dumb looking character in this movie whom McMurphy calls “Chief”. The tall Red Indian Chief (Will Sampson) is not part of any of the therapy sessions. Why? Because he is deaf & dumb. Or so everybody believes… until one day when McMurphy and Chief are sitting next to each other, McMurphy offers a gum to Chief. And Chief says, “Thank you”. And that is when McMurphy realizes Chief is not dumb. He is normal like anyone else but pretending to be deaf and dumb. Why? Because he can remain in the background – almost invisible – until he can figure his way out of the crazy system. And Chief does find his way at the end to escape the mental hospital. Does this strategy work in real life? Yes, it does. Edgar Schein, Professor Emeritus at MIT, discovered this strategy when he talked to prisoners of war in Korea. He says in an interview, “In organizations, individual learners lie, cheat, go underground - they do whatever they have to remain invisible. And in large organizations, going underground isn’t that difficult.” Remember what Patrick’s boss in IBM, Jim Canavino, Senior VP for Strategy and Development, told him about their Internet project? “You know, we could set up some kind of department and give you a title”, Canavino said, “But that would be a bad idea. Try to keep this grassroots thing going as long as you can.” Here is a rare case where boss helps you remain invisible – away from the management review meetings. Do you work on a sunset product? Congratulations! You are already in the first chamber. Make the most of it. In the world of Facebook and Twitter “learn to be invisible” may look just as bad as suggesting “learn not to breathe”. Don’t be so sure. Andrew Wiles used a brilliant ploy to fool “the system” before embarking on a solitary journey in his attic to solve Fermat’s Last Theorem. Instead of sending one long paper to a journal from the results he had before embarking on the journey, he split them into several smaller chunks and kept sending one small paper at regular intervals. “The system” kept thinking Andrew is slowing down. Now, please go ahead and conclude what I am up to based on my Facebook status! Didn't realize I was writing this blog on a day which is remembered for a crazy system "punishing" a non-conformist - Good Friday. Saw "Passion of Christ" in the evening on TV depicting the final 12 hours of Jesus's life. Realized after reading your article that, that's what Chanakya did to to stop Alexander's march and then to overthrow Nand dynasty. Thanks Ravindra. I didn't know this Chanakya story. Will definitely read it.